Few things are more basic to daily life than a pure and constant water supply. Nowadays virtually every home in the country has mains water supply and hot and cold taps. But only a generation or two ago, every drop of water had to be carried indoors – either from a pump or, in this area, often from a well. An old Ordnance Survey map shows that in 1897 (just over 100 years ago) there were about twenty wells in Buriton village. Perhaps there was one in your garden ? Is there any trace of one there now ? Does anybody know when they were constructed, how deep they were or who dug them ? Buriton also obtained other supplies of water. The Bonham Carter estate had a private reservoir at the top of the hill near Dean Barn. Water was pumped up to it from the pump-house just beyond the railway line. 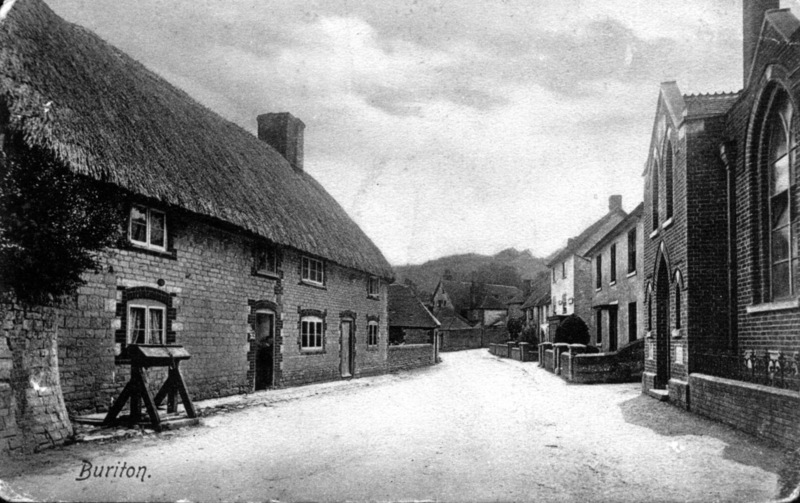 The reservoir served Buriton House and then a supply came back towards the village for the greenhouses off North Lane. Taps were also installed for some of the residents of North Lane and gradually this supply extended to other parts of the village. At some time (perhaps after the death of one of the Bonham Carters ?) the authorities took over the water supply. It was about 1963, however, before Nursted Farm and other outlying places received a mains supply. Until then, they had relied on water being pumped to them by hydraulic rams. Does anybody know where these were, which houses they served, or how they worked ? Mary Kelsey recalls growing up in the Poor House when it was six dwellings. “We had two bedrooms, a scullery and sitting room. Amenities were very primitive – electricity downstairs (one light in each of the two rooms) and candles upstairs. There was one outside tap for the six houses so every drop of water had to be fetched in by bucket and disposed of in the same way. On frosty mornings we used the minimum amount of water, hoping that it would last and we also hoped that one of our neighbours would go out first with a kettle of hot water to thaw the frozen tap. On my wedding day I cycled to the far end of the village for a bath; then cycled back before donning my finery. Anyone who has experienced outdoor privies must consider indoor sanitation to be the blessing of the century. The six houses all had their own privy at the top of the gardens. It was no fun to toil up the slope on a dark and wet or wintry night. Cleaning the privies must have been a dreadful task. This was done by the sanitation tanker which called once a week to empty the buckets of sewage. It was known as the ‘Violet Cart’. It caused much amusement among the villagers as the men appeared totally unaware of any health hazards and they would eat their sandwiches as they went along”. Constructing a well was no easy task. It was a costly, slow and laborious process. Near the surface the ground would often be loose and would require some support or lining to prevent it collapsing into the well. The depth of such supporting walls depended on the nature of the underlying strata. Once firm rock or a compact layer of clay was reached the brick wall could be discontinued. Some wells, however, have a masonry wall which extends to the bottom. Traditionally, this lining was constructed on an iron curb. This curb was lowered into the ground by removing the soil below it. The curb and the wall were gradually sunk into the shaft. At each stage more brickwork or masonry was added to the upper layers. This was slow work as very few bricks could be lowered at a time – in a bucket – and of course the bricklayer had to stop work to unload them each time. The confined space inside a well shaft limited the number of men who could work on the excavation and every shovelful of spoil had to be lifted to the surface. And, towards the end of the digging, the poor chap at the bottom of the well would almost be drowning. Ventilation was also important. When we breathe out our exhalation includes carbon dioxide which is heavier than air. Without a ventilation system the concentration of carbon dioxide at the bottom of the shaft could make work impossible. Well-diggers knew the risks and needed to be men of courage as well as skill. With only a candle to warn them of unbreathable air, some will have been overcome by gases – and others will have slipped and drowned. 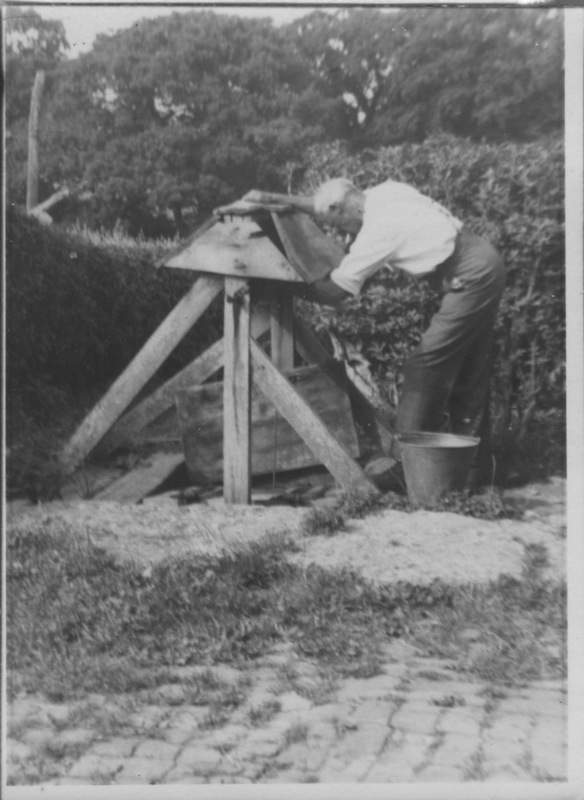 Do you know anything else about old wells or water supplies in Buriton?